Joint-training exercises with allied nations is nothing new to the US military. It reinforces relations between foreign powers and familiarizes them with each other’s standard operating procedures in the event of a military conflict. 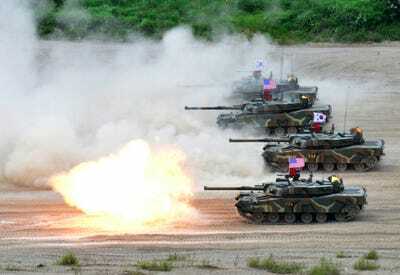 As one of these important allies, South Korea has trained with the US military for years to stabilise the Korean peninsula in case of a flashpoint crisis. Because North and South Korea are technically still at war, the US’s presence is seen by many as a deterrent to a conflict with North Korea. 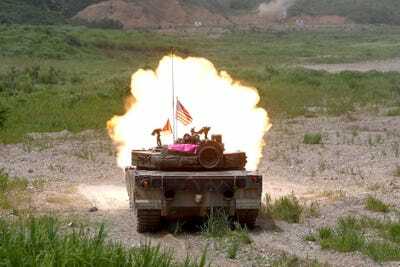 The two major drills – Foal Eagle and Key Resolve – will include, respectively, 11,500 US troops and 290,000 South Korean troops, and 12,200 US troops and 10,000 South Korean troops. Although the drills were originally scheduled for March, it was postponed after North Korea resumed diplomatic relations with South Korea amid the 2018 Winter Olympics in Pyeongchang. Unlike previous years where North Korea claimed the drills were a precursor to a military strike, North Korea’s response to this year’s exercises has been surprisingly muted. US Marines and South Korean soldiers await further orders inside their armoured vehicle, during a joint combat training exercise. 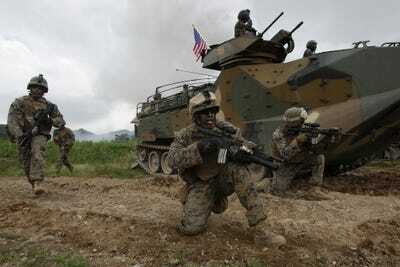 US and South Korean Marines aim their rifles near their amphibious assault vehicles during Foal Eagle, March 30, 2015. 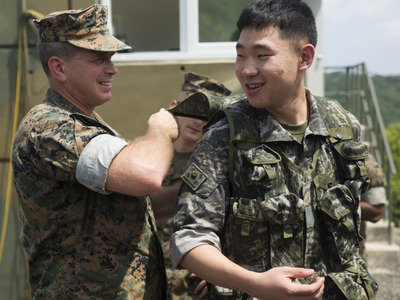 US Marines from 3rd Marine Expeditionary force deployed from Okinawa, Japan, train with South Korean soldiers in Pohang, South Korea, July 6, 2016. A US Marine aims his weapon at the US Army’s Rodriguez Range in Pocheon, South Korea, March 12, 2010. 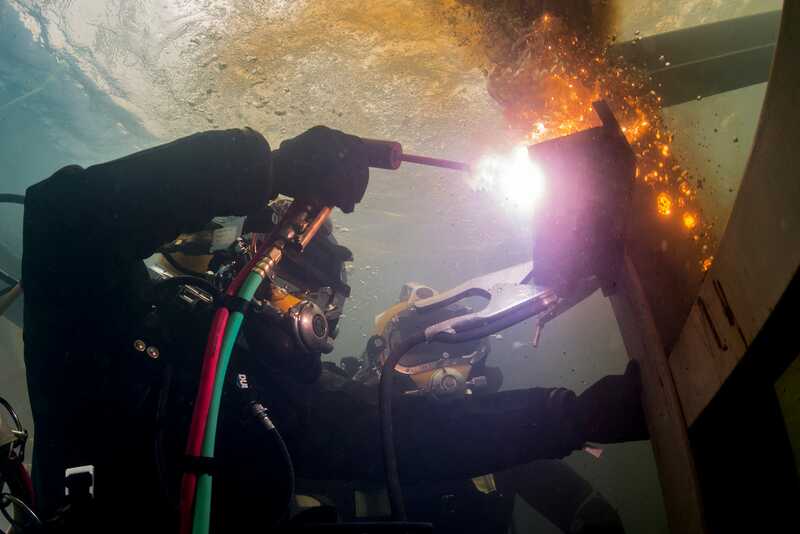 A US Navy equipment operator cuts a piece of steel in a training pool at South Korea’s Naval Education and Training Command in Jinhae, South Korea, March 31, 2017. 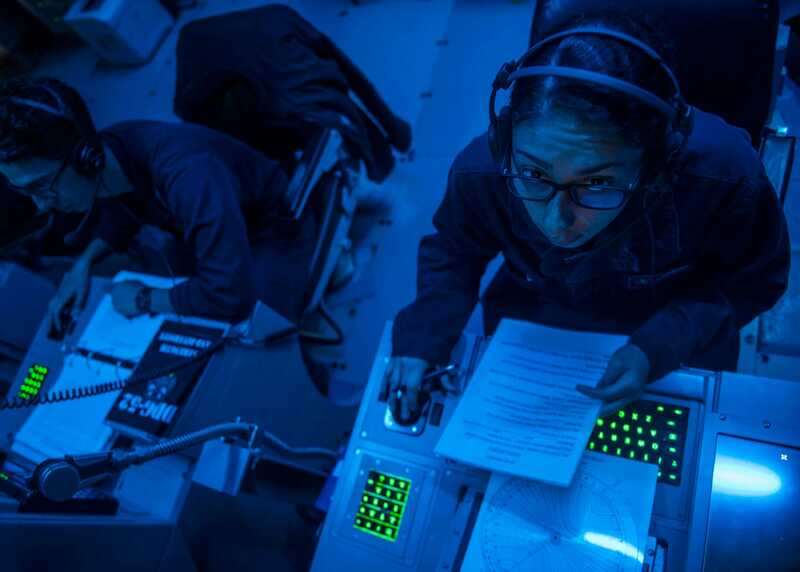 US Navy sonar technicians from the sonar central room of Arleigh Burke-class guided-missile destroyer USS Barry monitor ship bearings for contact during Foal Eagle, March 21, 2017. South Korean K1 tanks unleash rounds at the fire training field. US Army OH-58D Kiowa Warrior helicopters fly during a combined arms live-fire exercise for Foal Eagle at the Rodriquez Multi-Purpose Range Complex in Pocheon, South Korea, March 25, 2015. Air assets, such as the US Navy’s F/A-18 Super Hornet, have also been utilised amid the drills. US Army CH-47 Chinook and Black Hawk helicopters take part in Foal Eagle at a training field in Pocheon, South Korea, March 25, 2015. US Army Humvees move out after a live firing drill at the Rodriguez Range in Pocheon, South Korea, April 11, 2014. 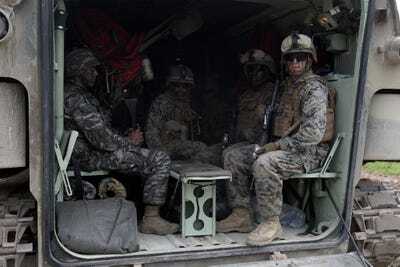 Some tasks for Marines are universal. 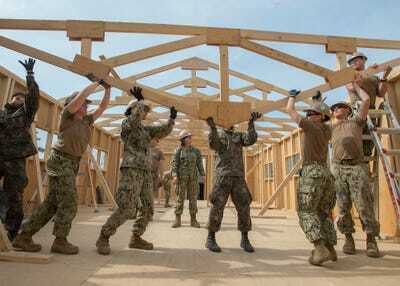 Here, South Korean Marines remove sand on the portable roadway for transportation during an over-the-shore exercise during Foal Eagle in Pohang, South Korea, April 22, 2013. 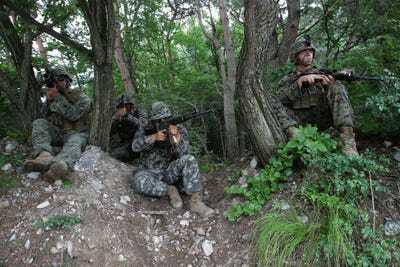 The military exercises are typically scorned by liberal South Korean lawmakers and anti-war protestors. Some protestors manage to get up close and personal to the drills. Service members also take part in cultural exchanges. A US Marine examines a South Korean translator’s flak jacket during the Korean Marine Exchange Program at Suseong Range, South Korea, June 30, 2016. US and South Korean Navy seabees tear down a forward operating base in Busan, South Korea during Foal Eagle, March 16, 2016.